Newcastle found it a bit more difficult defending against 11 man Fulham rather than Wigan’s ten men a week ago. Both teams put on a show for the Monday night TV audience but that is little consolation when you come away with nothing. At Craven Cottage Newcastle were a strange mix of some very good play going forward but slack play at the back and I lost count of the number of times our players lost the ball. I don’t think it would be any kind of a revelation to say the balance is all wrong in our eleven. 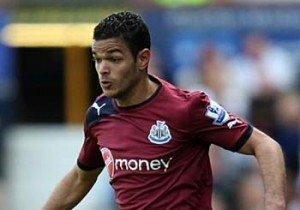 Players like the returning Hatem Ben Arfa can paper over the cracks a lot of the time but even their brilliance can only go so far. Watching players like Santon and Ben Arfa on the ball it is like they are playing a different game at times to players like Williamson and Simpson, which of course they are in reality. When people have talked about whether Ba and Cisse can play together and should one be left out…tonight again proved to me that the problem is elsewhere. With Ben Arfa coming inside more in the second half and feeding balls into the two strikers’ feet in and around the box, it really brings them to life. Defenders know that one wrong move and it is a free-kick or penalty and so can’t take a risk. Compare that to our standard play of launching long balls to Ba and Cisse where even if the ball reaches them they are isolated and outnumbered. We need to improve the service to the two front men, not drag them off the pitch. Our midfield as a whole isn’t good enough, Anita is improving but whether he would ever be good enough to be the playmaker to make up for Tiote’s deficiencies in the creative area, is open to question. While Gutierrez’ hard work is looking more and more like it might not be enough in this midfield.